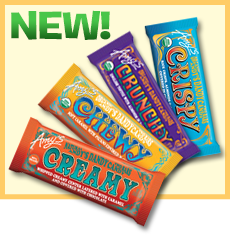 All-Natural Candy, Potato Blitz, Pumpkin Love & MORE! Amy's Organic Two Bars Andy's Dandy Candy - YUM ALERT. These chocolate-covered candy bars come in four varieties: Creamy (whipped filling layered with caramel), Chewy (caramel and pecans), Crunchy (English toffee and almonds), and Crispy (rice crisps, almonds, and caramel). Crunchy is the HG favorite! Each piece (HALF of the pack) has 100 - 120 calories, 5 - 7g fat, 45 - 50mg sodium, 10 - 19g carbs, 0 - 1g fiber, 8 - 15g sugars, and 1g protein (PointsPlus® value 3*). In select health-food stores and online. Quaker Warm & Crunchy Granola - Wondering how a hot cereal can also be crunchy? The specially baked granola clusters stay crisp even after being cooked! In Apple Cinnamon, Honey Almond, and Cranberry Almond, each packet has 190 - 200 calories, 3.5 - 4.5g fat, 125 - 140mg sodium, 36 - 38g carbs, 4g fiber, 10 - 12g sugars, and 5g protein (PointsPlus® value 5*). It's meant to be prepared with milk -- we'll be using the fat-free stuff! Weight Watchers Smart Ones Classic Favorites Soups - Frozen soup rocks! We can't wait to try these single-serving, heat-n-eat finds in Fire Roasted Vegetable, Southwest Style Vegetable, Loaded Potato, and Spicy Black Bean. Each 8-oz. portion has 60 - 170 calories, 0.5 - 6g fat, 420 - 550mg sodium, 11 - 28g carbs, 2 - 7g fiber, 3 - 5g sugars, and 2 - 8g protein (PointsPlus® value 1 - 4). Hit the freezer aisle, people! Fun with Potatoes: New HG Recipes, Plus an AMAZING Contest! 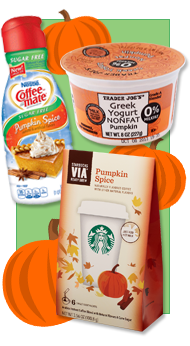 Coffee-mate Sugar Free Pumpkin Spice Liquid Creamer - Nothing says fall quite like tasty seasonal creamer in your coffee. Add a tablespoon of this yummy stuff for 15 calories and 1g fat (PointsPlus® value 0*). And if it's still 90 degrees out where you live (like it is here at Hungryland), spike your iced coffee with it. Just remember to measure to avoid an overpour! Trader Joe's Nonfat Pumpkin Greek Yogurt - YAY! This tasty protein-packed treat is back. Stick your spoon into an 8-oz. container -- 190 fat-free calories and a whopping 18g protein (PointsPlus® value 5*). Another seasonal yogurt returning to shelves? Yoplait Light Pumpkin Pie, with 90 calories and 0g fat per 6-oz. container (PointsPlus® value 2). Yum! Starbucks VIA Ready Brew in Pumpkin Spice - Sweet spiced coffee is our friend, especially when it's this easy to prepare. If you're looking for a dairy-free alternative to the Pumpkin Spice Latte (which reportedly has condensed milk in the base), give this a try with your milk swap of choice! Each packet of the instant coffee has 60 calories and 0g fat (PointsPlus® value 2*). Hungry Girl is joining forces with a pop-culture powerhouse... 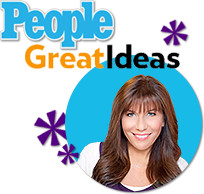 Check out The Dish in the NEW Great Ideas section of People.com! Lisa (HG herself) will be posting about food trends and giving celebrity recipes a guilt-free spin. Look for the latest every Monday! ***Could exercise reduce your calorie intake? Maybe! A recent study suggests that high-intensity interval training may reduce a person's desire to eat. Reportedly, this study did use fairly neutral-tasting foods for objective results... We wanna know what happens if exercisers are presented with post-workout cake. ***Gnu Bars have a gnu look… and a gnu name! Show some love for Gnu Foods FiberLove Soft-Baked Fiber Bars. In flavors like Cinnamon Raisin and NEW Peanut Chocolate Chip, each deliciously chewy, high-fiber bar has 130 - 160 calories and 3 - 6g fat (PointsPlus® value 4*). Gneato! ***Who else is getting a makeover? Cracker Barrel! The country-style chain has added a lightened-up section to its menu. Wholesome Fixin's features breakfasts with 500 calories or less and lunch & dinner options with no more than 600 calories. The Spice Rubbed Pork Chop meal has just 420 calories when served with a side of green beans and mixed seasonal vegetables or steamed broccoli. Mmmm... And that's all we've got. HG out! More HG Fun Every Monday! 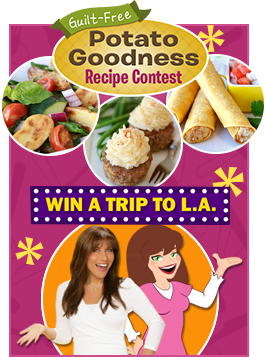 If one of your pals wins the potato contest, they might bring YOU to LA as their guest. Click "Send to a Friend" now! Today, September 23rd, is National White Chocolate Day. (Some say it was yesterday, but we're celebrating today!) Sounds like a great reason to make some White Chocolate Macadamia Softies. Do it!